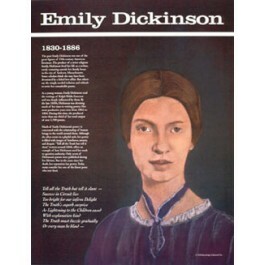 This educational poster of the famous 19th century American poet Emily Dickinson features a striking artist's illustration of her, as well as biographical text detailing her life and accomplishments. Emily Dickinson lived her life as a recluse, rarely venturing outside her family home in Amherst, Massachusetts. 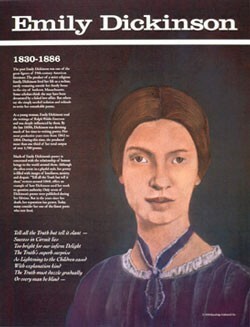 Although she wrote more than 1,700 poems, only seven were published in her lifetime. Her original use of language has made her one of the most important poets in all of American literature.